Tata Digital Health, TicketNew, Haptik ! Catch the latest launches in the world of Gift Cards, brought to you by Qwikcilver – Everything Gift Cards! It is the new year, and we are already busy with new launches. This time our launches span diverse sectors such as a health initiative, an entertainment ticket platform and a virtual assistant heralding the arrival of the future. We are also overjoyed this month at reaching a remarkable milestone with our Woohoo App. Read on to know more! We hope that you find this edition of the Qwikcilver newsletter interesting and whether it is bouquets or brickbats we always look forward to hearing from you. We are excited to partner with Tata Digital health for their rewards programs. Tata digital health is Tata Group’s venture in the Digital healthcare space. The digital healthcare business focuses on analytics-based electronic medical records, clinical diagnostics, monitoring devices, home monitoring and mobile tracking of health and wellness parameters. Users are incentivised and get to earn rewards points for engagement on app through various activities such as logging health data, achieving health goal, recording nutrition data etc. Partnering with us now means that the accrued reward points can be redeemed for Gift cards by the user. A brand-new journey begins for Qwikcilver with our partnership with TicketNew. TicketNew began its journey 8 years ago in Chennai, India with their web-based, end-to-end, integrated ticketing management solution. The TicketNew platform has now been adopted to not only cinema venues, but also sports stadium, theatres and music venues. Under this partnership TicketNew can now generate e-gift cards through our proprietary bulk card generating tool for their corporate orders. Additionally, the Ticketnew e-gift cards are now available on Woohoo.in, and users can redeem these gift cards on TicketNew. At Woohoo we have entered into an all new exciting partnership with Google Tez. Tez is a mobile payments service by Google which operates atop the Unified Payments Interface, developed by the National Payments Corporation of India. It can be used where UPI payments are accepted. As part of the partnership, over 15 million Tez users will now have access to the Woohoo platform to send digital gift cards from 100+ brands across 25 categories including fashion, dining and travel amongst others. Additionally, our consumers will also benefit as they will now be able to avail the newly launched UPI-based payment system on the platform. Do check out the exciting offers on Woohoo when shopping with Tez! Woohoo touches a new milestone! Woohoo! We are thrilled that the Woohoo App has hit 500,000 installs on Android devices as announced by the Google Play store. This reaffirms the fact that Gifting today has become an everyday affair and the Woohoo app makes it easy to gift your loved ones. With more than 100 brands and many more getting added, Woohoo lets you gift your loved ones and spoil them silly with fabulous choices and yet making it extremely effortless for you to do so. 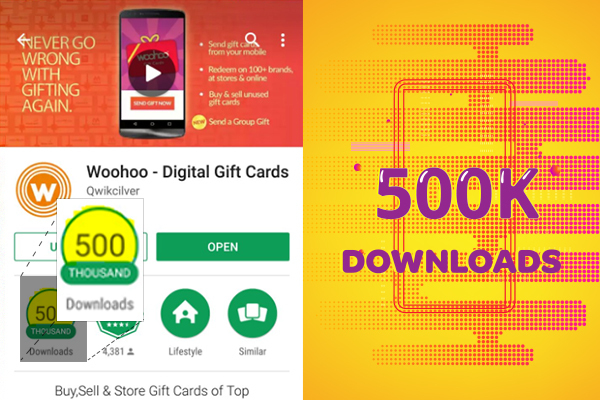 Go on, go ahead, download the Woohoo app today and experience gifting like never before.